UK HB first edition, signed by the author - book 4 of the Skulduggery Pleasant series. Harper Collins, UK, 2010. Hardcover. Book Condition: As New. Dust Jacket Condition: As New. Signed, doodled and dated by the author to the title page. Additionally signed to the limited edition alternate cover by the cover artist Tom Percival. Comes with Landy event flyer and promotional bookmark. 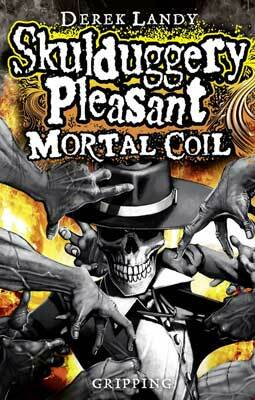 Synopsis : Following the shocking revelations of DARK DAYS, get ready for the fifth instalment of the bestselling Skulduggery Pleasant series -- guaranteed to contain at least 40% humour, 50% action, and 100% thrills! "The blonde girl with the black lips turned to Valkyrie. 'We know,' she said. 'We've seen the future. We know you're going to kill the world!'" Skulduggery Pleasant and Valkyrie Cain are back -- just in time to see their whole world get turned upside down! While they struggle to protect a known killer from an unstoppable assassin, Valkyrie is on a secret mission of her own. This quest, to prevent her dark and murderous destiny, threatens to take her to the brink of death and beyond. And then the body-snatching Remnants get loose, thousands of twisted souls who possess the living like puppets, and they begin their search for a being powerful enough to lead them. Facing such insurmountable odds, Skulduggery, Valkyrie, Ghastly and Tanith can trust no one. Not even each other!